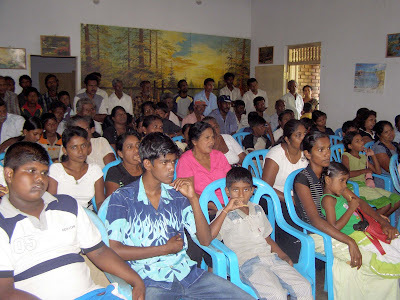 The AGM of Negombo United Lagoon Fisher People's Organization was held on 08th December at NULFPU office. The AGM was convened by the newly elected office bearers to evaluate the annual activities and plan out for the new year 2009. There were around 90 men, women and children attended the meeting which is an achievement compare with the past few years. Also the supporters and the volunteer activists are taking part most of the activities such as cleaning the lagoon, removing the shells from the lagoon, organizing youth, providing identity carsd for the fishers, dialogue with security personnel on the safe fishing activities at the lagoon etc. Also, the volunteers attended the advocate the NARA, the agency which is responsible for the research and development of the aquatic resources of ther MOF. Mr. Marcus fernando addressing the AGM said that they are committed to build up the organization which is their own and need to bring the lagoon fishers under the umbrella of the lagoon fisher prople's organization. After the sudden death of former chair person, he says he is trying to build up the organization in many aspects of women,. children and men as well. The admin secrertary of NAFSO, Ms. geetha Lakmini, stated at the meeting that there will not be a solution to the issues related to security, untill and unless there will be a solutiiin to the ethnic crisis and prolonged war situation in the country. That is the main reason which people loss their jobs and so many restrictions, not only north and east but also Negombo Lagoon at the west coast. So, we all need to find a solution which is long lasting one not like war and temporary one. Herman Kumara, Convener of NAFSO stated that the resource amangement and protection of aquatic resources is responsibility of the fishers and not only the government officials. Everybody should come forward to protect them and need to engage in an organized manner. COmpare with Puttlam lagoon, the Puttlam lagoon fishers are mucgh ahead compare with the Negombo lagoon as they proterct, manage and prevent harmful fishing in their lagoon. They earn much higher income and have better life conditions. Jusde Shelton, the treasurer and a bona fide fisherman said, the war affected their lives as most of the detructive fishing methods ontroduced with the internally displaced people who came to Negombo are for the settlement after the war. So, the NULFPO started in 1983 after the war struck in the country. There were some nets distributed among the fishermen and also some books were distibuted to the school children who are members of the organization. This was a good opportunity to build up the unity and strength of the fisher people among the 35 villages of negombo lagoon.